As more areas and price ranges reach market equilibrium, we are seeing home values move higher. If you are wondering if this trend will start to cool for homes for sale in Tallahassee, I would tell you that it is highly unlikely when we consider two key points. 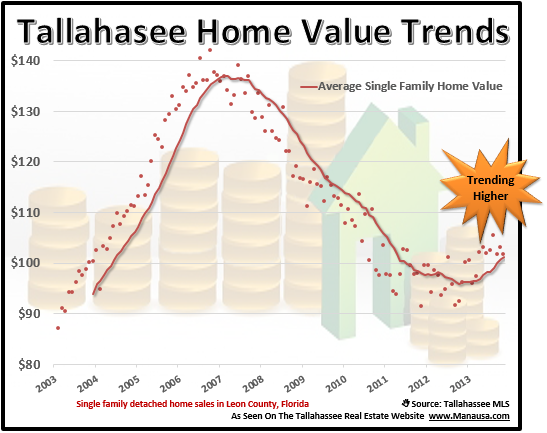 When we look at a graph of home value trends in Tallahassee, we can see that all recent activity has been above the trend line. Note how average home values for all but one month this year have been landed above the one-year trend line. This suggests that we are in a very strong trend that should continue moving in the same direction. But there is another reason why we suspect average home values in the Tallahassee real estate market will continue to rise. The market is always seeking cost ... but what does this mean? When the supply of homes greatly exceeds the number of buyers, we say that we are in a buyers market and homes will often sell below what it would cost to replace them. When the supply of homes does not keep pace with demand, then buyers will pay a premium to get a home, often at prices well above what it would cost to replace them. Regardless of the market, home values typically fluctuate at or near the cost of replacement. When values get too far away from replacement cost, the market shifts to move values back in line. Why? Because builders will stop building if they cannot get their cost and profit back on sale. But as soon as they can build a home for profit, they do so. I hope both the trend and the video explaining real estate market cycles helps you understand the overall market. But you need to know that supply and demand are in balance for only certain price points, while some are still dealing with an imbalance between the number of homes for sale versus the number of qualified buyers in the market. Specifically, high end homes are going to continue to fight this imbalance, with the likely result being continued declining values. If you are curious about what you could get for your home in today's real estate market, just drop me a note and we can schedule a time to evaluate your home and it's likely selling price.